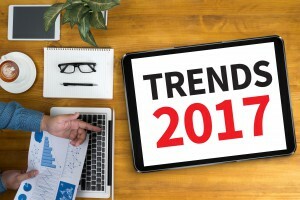 2017 saw some significant changes in our property markets. The year started with a bang and finished with a whimper. Foreign investment slowed down as we took away the welcome mat by raising stamp duty, hiking land land tax and adding other disincentives. 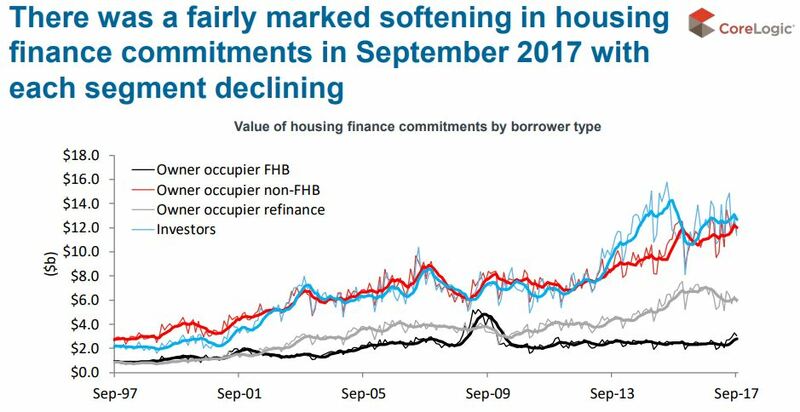 APRA slowed down investment lending by making the banks tighten their serviceability criteria and restricting interest only lending. 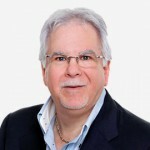 A surprise move in the Federal budget announced sweeping changes to depreciation laws virtually wiping out depreciation allowances on any new purchases of established properties. First home buyers came back – there were more than 94,000 first homes bought across Australia in the year to August, a 5.6% increase on the same time last year, in part becuase of First Home Owner incentives in some states. The oversupply of apartments increased in a number of states, especially in and around our CBD’s . Investor sentiment eased, especially in Sydney with the headlines changing form bom to uncertainty as house prices flatlined and boom time auction clearance rates dropped to more normal levels. 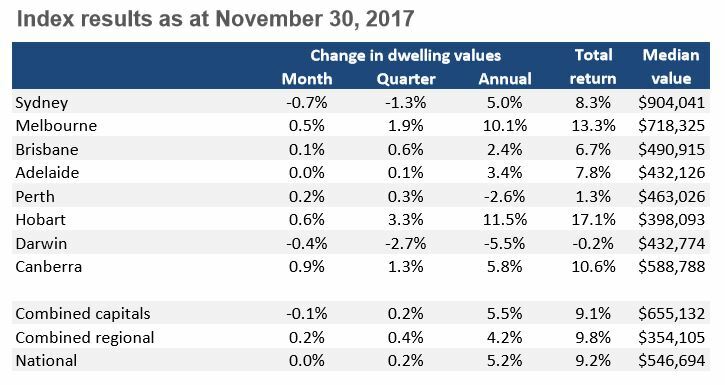 Around Australia dwelling values held steady in November, with a 0.1% fall in capital city dwelling values offsetting a 0.2% rise in values across the combined regional markets of Australia, according to CoreLogic’s November Hedonic Home Value Index results. Sydney and Darwin recorded value falls over the month while values were unchanged in Adelaide. 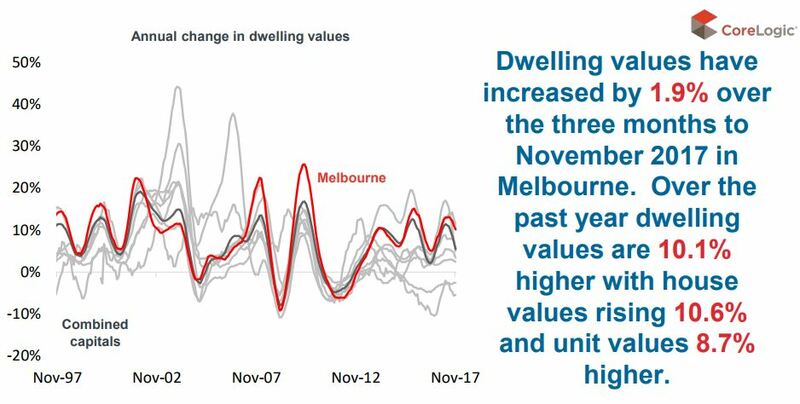 Over the past year, values are 5.5% higher across the combined capital cities and 4.2% higher across the combined regional markets. 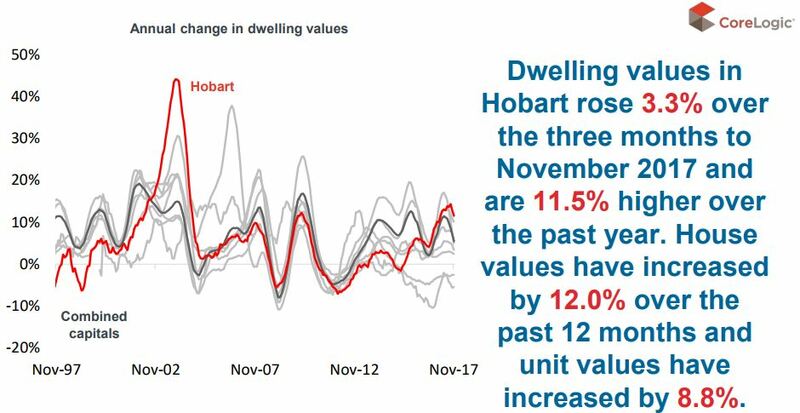 Dwelling values are 5.2% higher over the past year which is half the rate of growth in May of this year and the slowest annual rate of growth in 12 months. 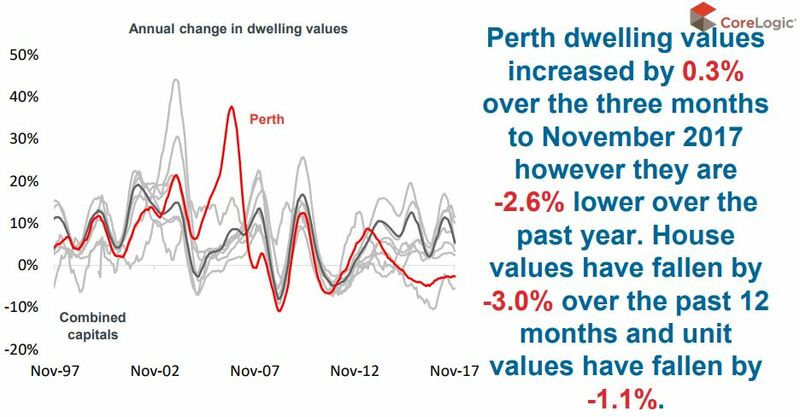 Over the year, only Melbourne and Hobart have recorded value growth in excess of 10% while values are lower in Perth and Darwin. 2017 was the year that the Sydney property market decided to take a breather. 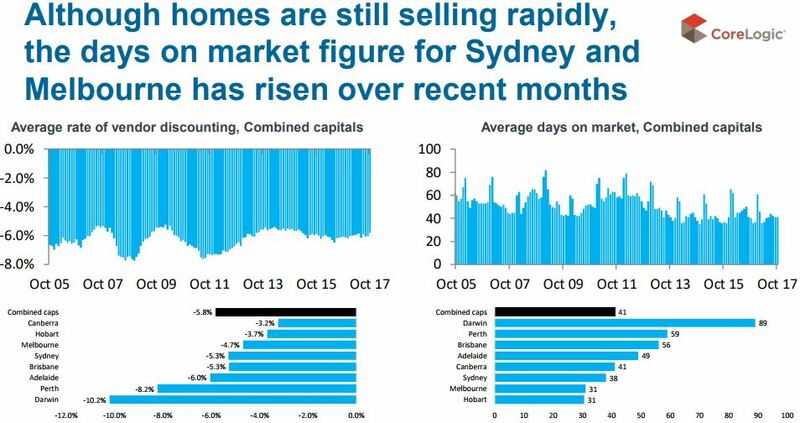 Having said that, the Sydney has had virtually no overall growth for the last 6 months now, and the continual headlines warning of the end of the Sydney property boom is concerning many investors and potential home buyers who are standing in the sidelines waiting to see what happens. 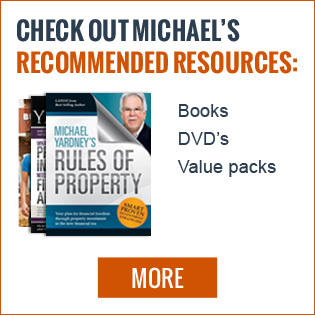 There are multiple markets defined by geography, price and type of property. And the market for A grade homes and investment grade properties is still strong. 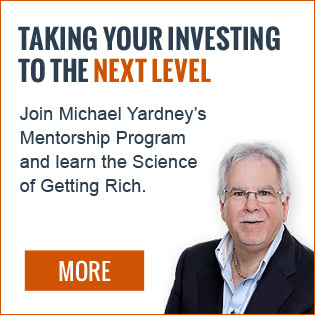 And by the way… there is no evidence of a bubble bursting or a hard landing. However prices are stabilising after more than five years of strong growth where values have risen by close to 70% during that time. Interestingly there are no suburbs left in Sydney with a median house price under $600,000 according to Domain’s September House Price Report. 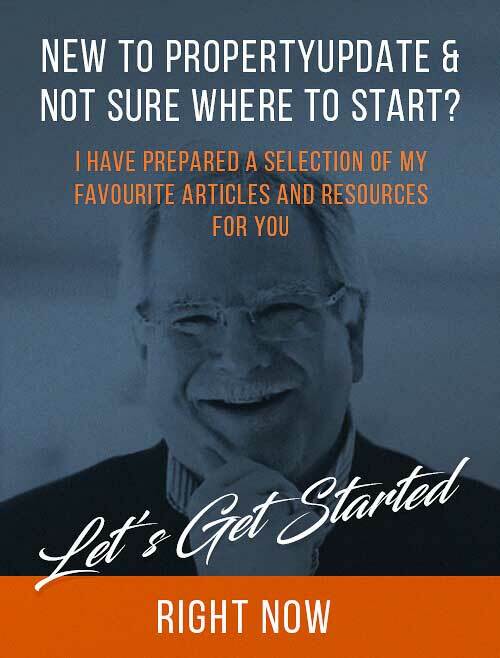 I see a strong economy with significant jobs growth, a rising population and the Harbour City’s status as an international financial hub, supporting continued property price growth over the next few years, albiet at a slower pace. 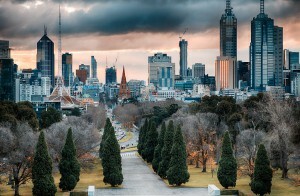 The Melbourne property market, had another strong year (+10.1%), performing better than most commentators predicted, fuelled by strong population growth (around 2.3% per annum) and a booming economy creating more jobs than anywhere else in the country and once again being voted the world’s most liveable city. The Melbourne apartment market has not performed as well as the house market, but is starting to pick up as the First Home Buyers Grant as a raft of new home buyers enter the market buying up established apartments. However the anticipated oversupply of CBD apartments did not eventuate, as 144,400 new residents moved into the State over the last year helping soak up all the new construction. While the Western growth corridor has been the predominant area for population growth, in part because of its affordability, the best investment location in Melbourne remain in the more established inner east, south east and inner northern suburbs. While the overall Brisbane’s property market only rose 2.4% over the last year, there is great potential upside for Brisbane houses which are considerably cheaper than Sydney or Melbourne. 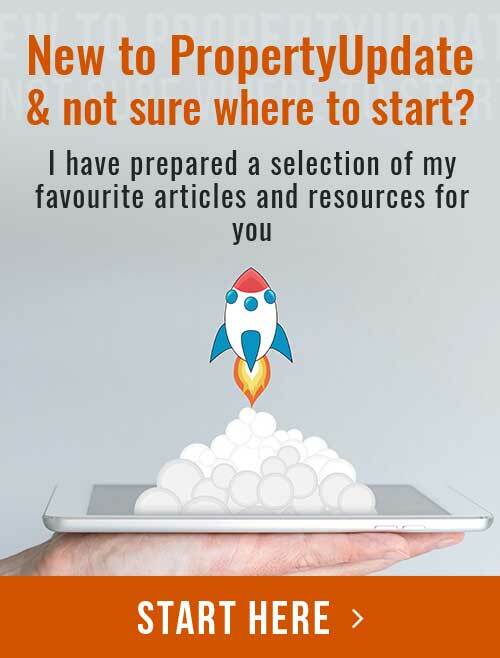 Brisbane’s market is very fragmented and there are still some areas that are performing respectably with good investment prospects and great places for young families to live cheaply. 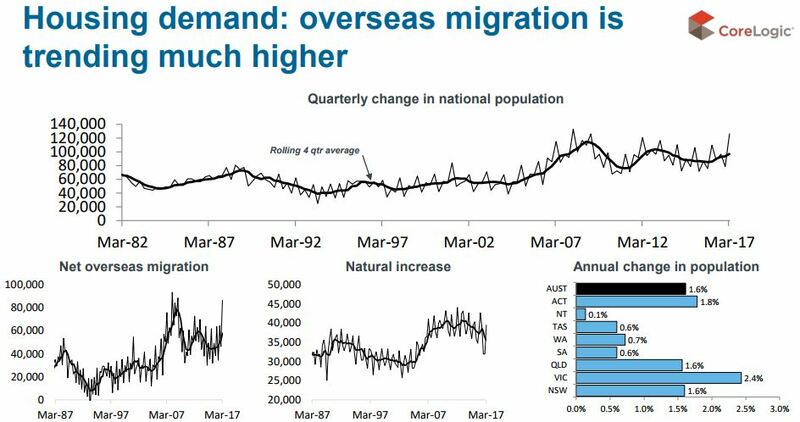 There are some turnaround signs including employment growth and a number of impressive infrastructure projects in the pipeline and this will lead to population growth – much of it from interstate migration. On the other hand, there is a significant oversupply of new high rise off the plan apartments overshadowing the inner city area and nearby suburbs with owners now giving significant incentives to attract tenants at a time of rising vacancy rates. These apartments are what I call “investment stock” (built for investors) which is very different to “investment grade” which are properties that outperform the market. 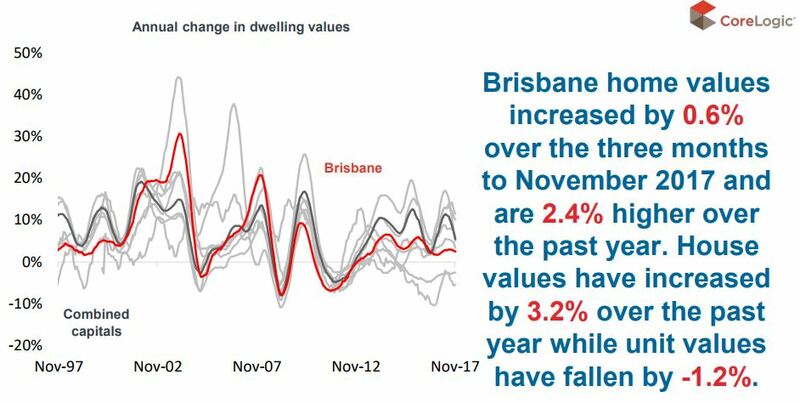 Some of these new apartments are now reselling at significant losses, demonstrating how far values have fallen and this has had a flow on effect dampening values of established apartments in Brisbane’s inner and middle ring suburbs. 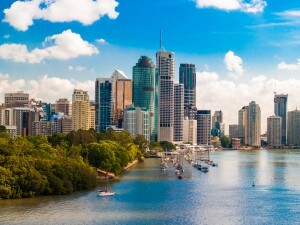 Investment bank UBS has warned one-in-five foreign property buyers is failing to settle on their new Brisbane apartments due to tighter regulations. 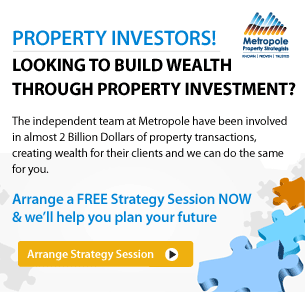 That’s why the Brisbane buyer’s agents at Metropole have been avoiding the apartment market for quite some time. Overall home values are up 3.9 % over the last 12 months while unit values only increased by 0.9%. 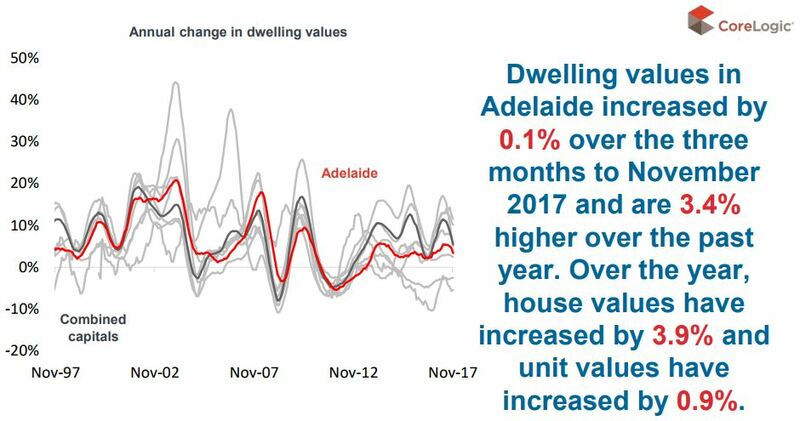 I know some investors are looking for opportunities in Adelaide hoping (“speculating”) prices will increase but there are few growth drivers in Adelaide with fewer than 8,000 new jobs created there last year. 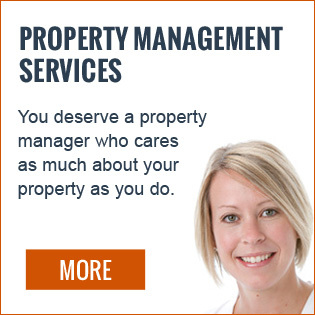 The Perth property market has yet to bottom, with prices falling 2.6% over the last year. 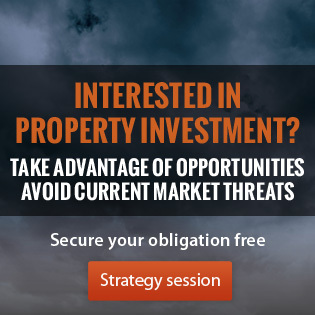 Due to the significant oversupply of new apartments developers are offering significant incentives to lure buyers, with discounts of up to $50,000, complementary solar panels, appliances and air-conditioning, but these buyers will not experience capital growth for years, so these short term incentives won’t make up for the lost opportunity. 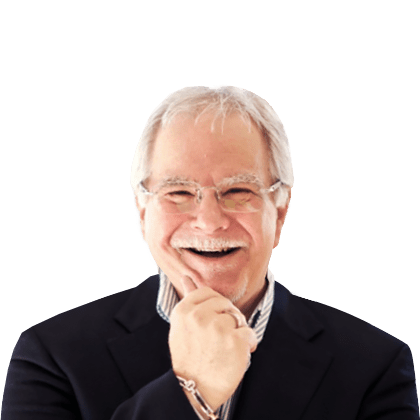 A few months ago the WA Labour Government’s first budget had no stimulatory measures for the property market – instead there was a 4% foreign buyer duty announced. This was supported by an upswing in the Apple Isle’s economy spurred by tourism and strong retail sales. BUT KEEP IN MIND IT IS A VERY SMALL MARKET. It is a small place and it doesn’t take much to influence it. 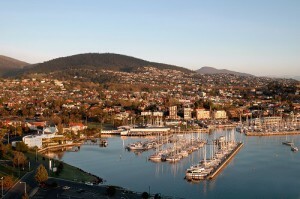 The local economy is picking up helped by the redevelopment of the Royal Hobart Hospital and upgrades to universities, hotels and retail precincts. 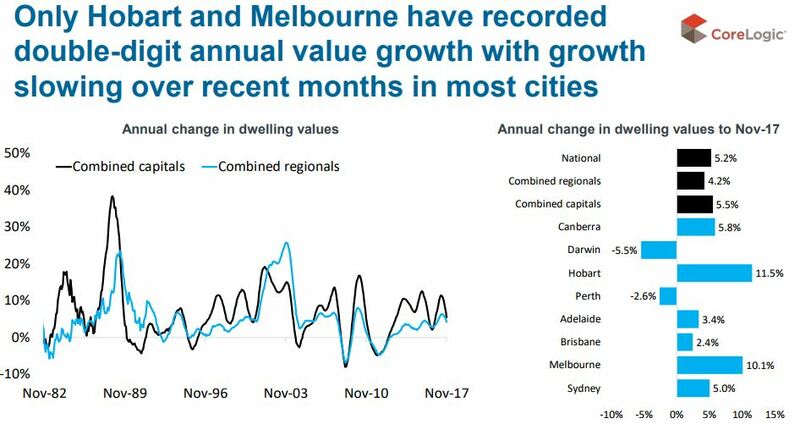 Even though some commentators are suggesting it’s a good place to invest, I don’t agree as there are few long term growth drivers and despite the current fast rate of growth, dwelling values only increased 27.3% over the last 10 years. 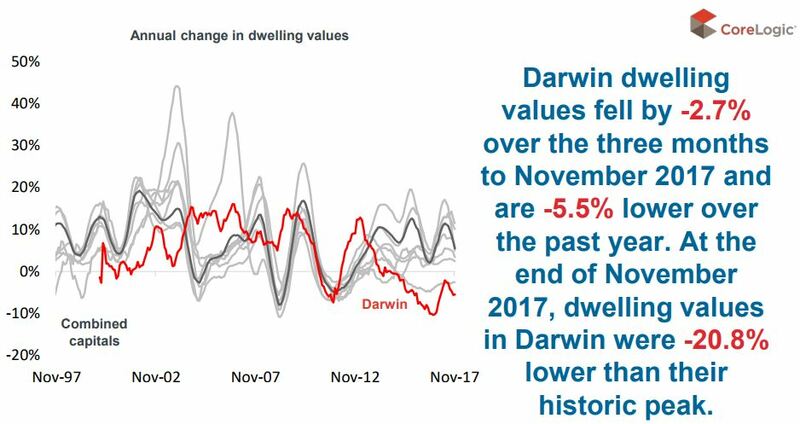 As opposed to the east coast capital cities where many jobs are being created, Darwin had a net increase of only 153 jobs last year, showing how its economy is languishing. 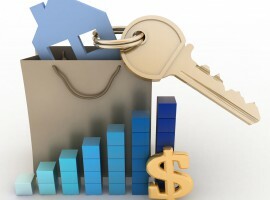 Canberra’s property market is a “quiet achiever” having performed well over the last year. 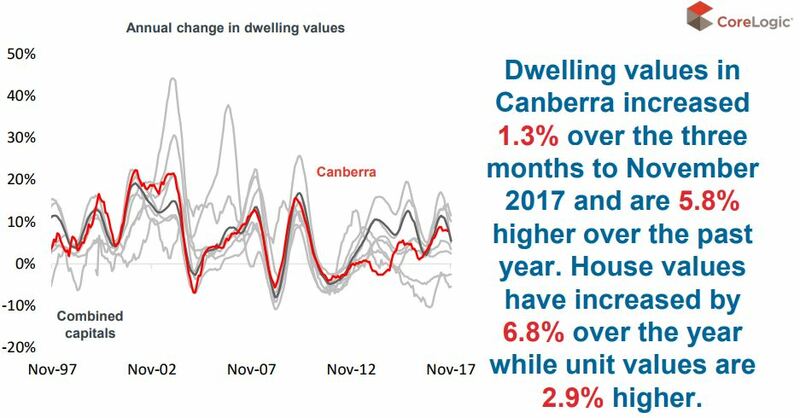 Canberra’s strong economy and above average population growth should underpin it’s property markets over the next few years. The ACT Government predicts ongoing strong population growth of 6% in Canberra by 2020. Around 60% of this growth will be due to natural increase and about 40% through net overseas and interstate migration. It is estimated that there were 70,173 settled sales of dwellings nationally over the 12 months to November 2017 with 296,245 settled sales across the combined capital cities and 173,928 settled sales across regional markets. 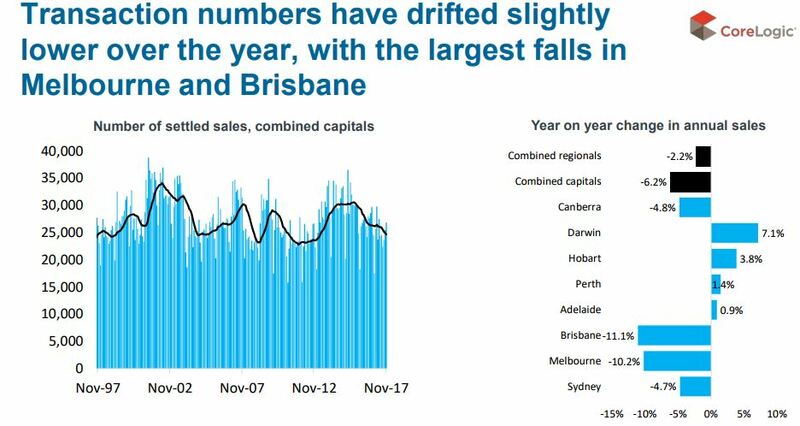 Transaction volumes have fallen over the past year in Sydney, Melbourne, Brisbane and Canberra but are higher across the remaining capital cities. 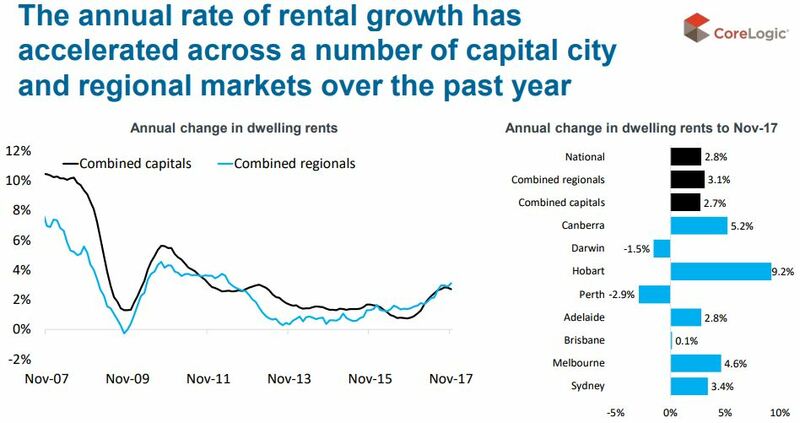 Gross rental yields were recorded at 3.6% nationally in November 2017; 3.3% across the combined capital cities and 4.9% across the combined regional markets. 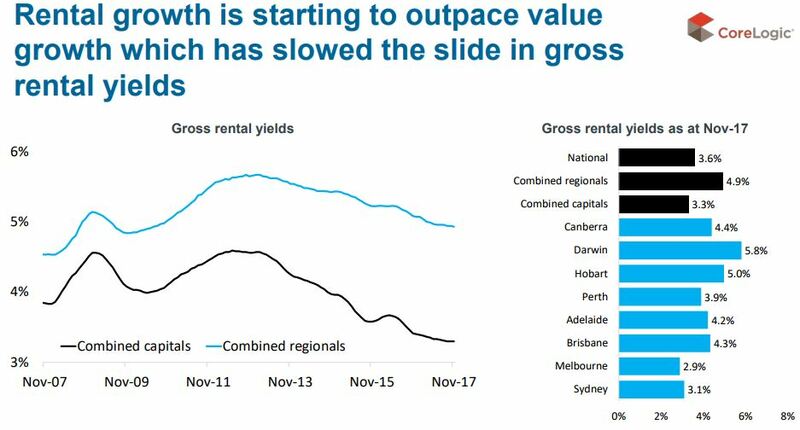 Gross rental yields are lower than they were a year ago across all capital cities except for Darwin. The typical capital city dwelling which sells for less than its initial list price is being discounted by 5.8% compared to 6.0% 12 months ago. 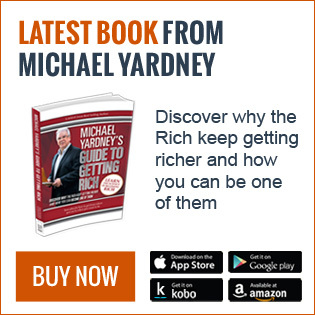 The level of discounting is currently lower than it was a year ago in Melbourne, Brisbane, Hobart and Canberra and unchanged in Adelaide. 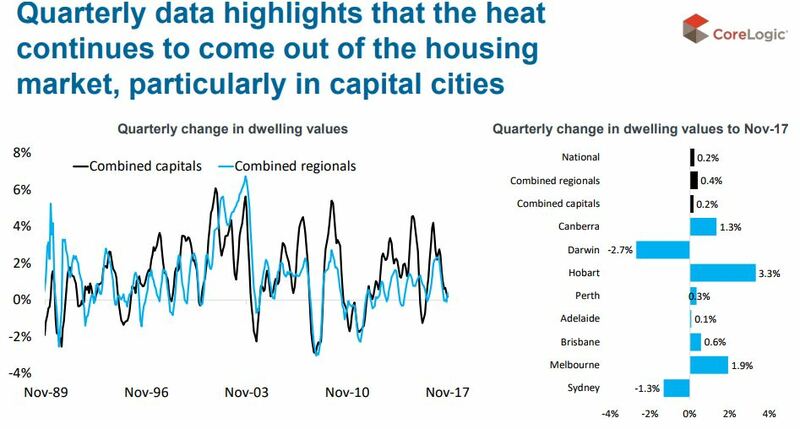 The typical capital city dwelling is taking 41 days to sell which is marginally higher than it took a year ago but up from a recent low of 36 days in March this year. 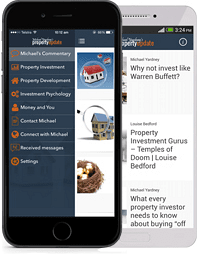 The days on market figure is higher over the year in Sydney and Brisbane and lower elsewhere. 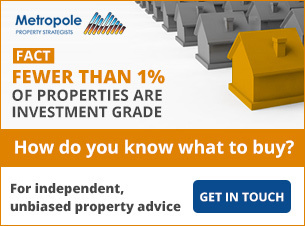 The number of new properties advertised for sale is -5.7% lower than a year ago nationally and -4.3% lower across the combined capital cities. Adelaide and Darwin are the only capital cities to currently have a greater number of new listings than they had a year ago. Over the past 28 days, total advertised properties were -4.5% lower than a year ago nationally but 2.0% higher across the combined capital cities. Perth, Hobart and Darwin were the only capital cities to have fewer total homes advertised for sale currently relative to last year. 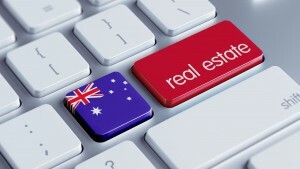 Total listings in Sydney are currently at their highest level since late 2012. 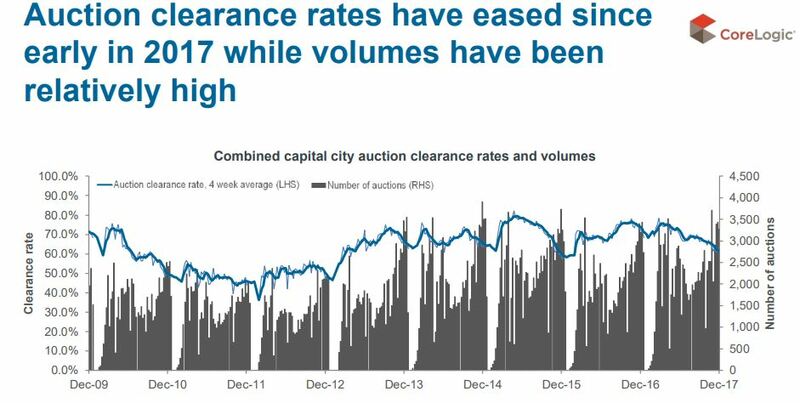 Combined capital city auction clearance rates have remained below 65% for each of the past 6 weeks. 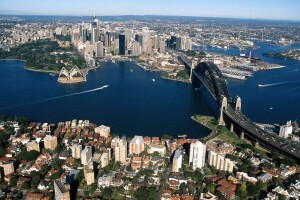 Sydney’s final auction clearance rate has been below 60% each of the past 5 weeks and are much lower than a year ago. Melbourne’s clearance rate has remained below 70% for each of the past 3 weeks. 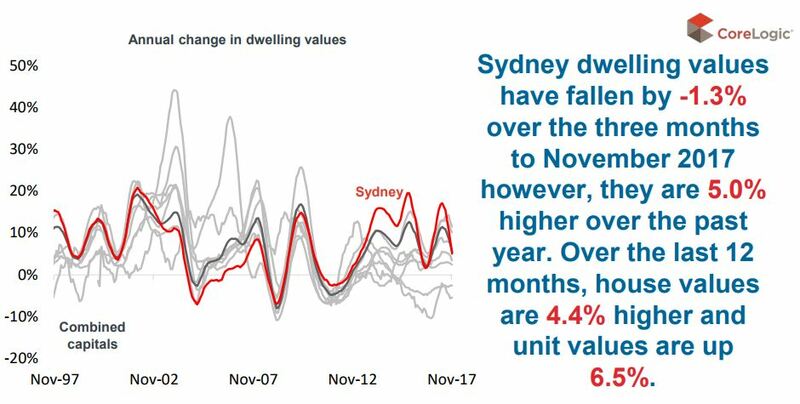 Earlier in the year Sydney and Melbourne have had clearance rates above 80% highlighting a marked slowdown, particularly in Sydney. 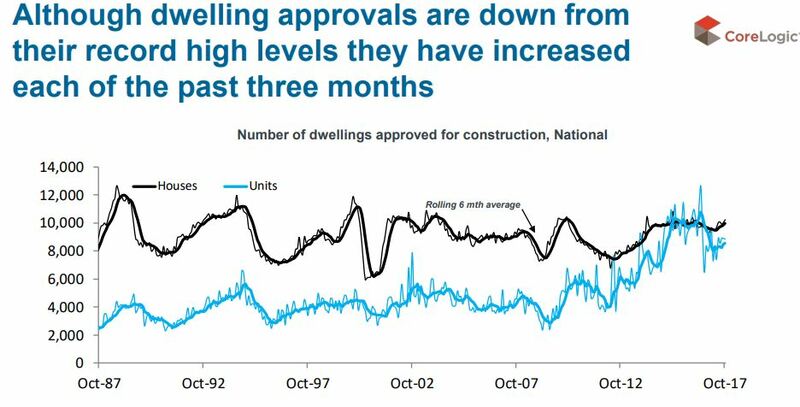 The number of dwellings approved for construction have eased from record-high levels to above the long-term average with approvals lifting over the past three months. 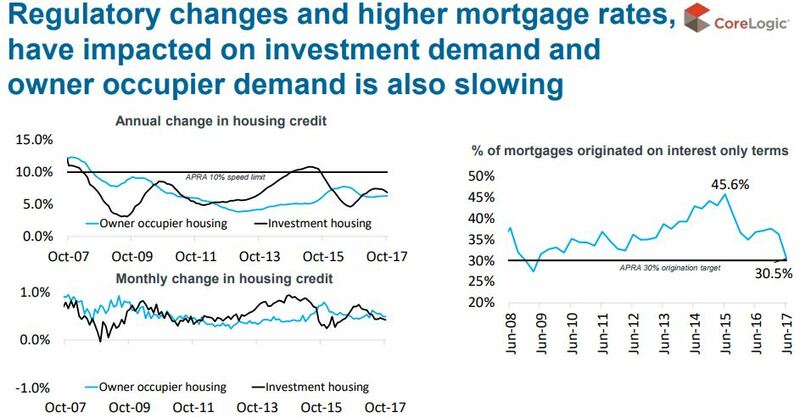 Upgraders and investors remain the key drivers of housing demand however, investor demand is slowing and first home buyer demand is lifting, particularly in NSW and Vic on the back of stamp duty concessions available. 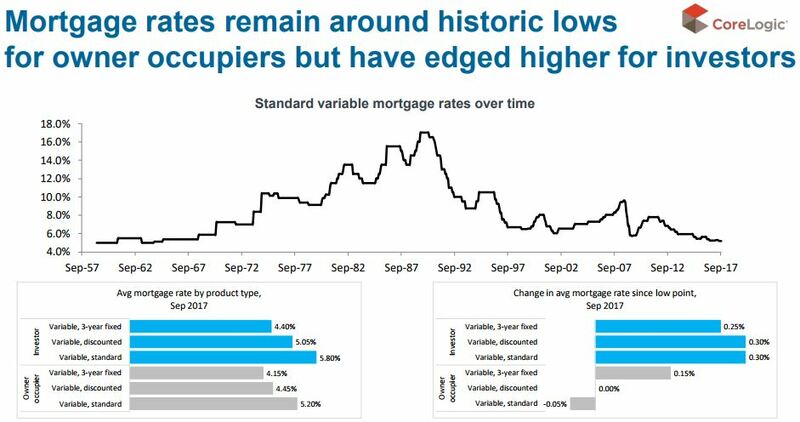 Mortgage rates remain at low levels however, investors are typically paying 60 basis points more on their mortgage than owner occupiers. 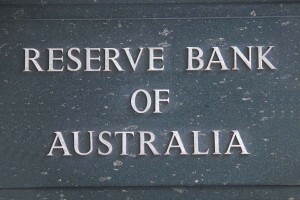 APRA and the RBA have done a good job slowing down our markets yet keeping us in a very low interest rate. 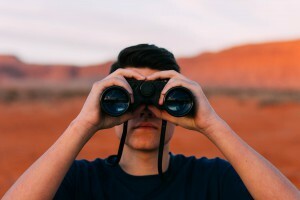 And financial markets have pushed expectations for a cash rate hike out to early 2019, implying that mortgage rates aren’t likely to rise materially over the foreseeable future. The CoreLogic Settlement Risk Report continues to show that Brisbane’s inner city is facing the largest potential uplift in unit stock over the next two years, with some precincts facing the possibility of a 40-50% increase in total unit stock within 24 months. 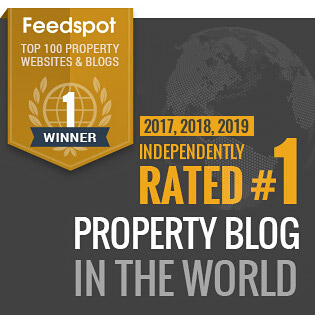 On the other hand, established apartments, particularly in Melbourne and Sydney, and those more geared towards owner occupier target markets rather than pure investment stock are likely to show a better performance. We seem to be moving into the next stage of the property cycle, one of moderate growth in some regions and virtually no growth in others. Thanks for the words of encouragement and kind thoughts Martin.